I am sure that some of the people who are involved with greyhound racing really care about their dogs, and treat them kindly. 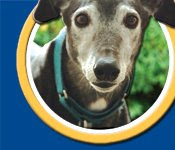 But the evidence shows that commercial dog racing is not conducted in the best interests of the greyhounds, who often sacrifice their lives and limbs and suffer from inhumane confinement in the service of what I hate to describe as a sport. Massachusetts has two greyhound tracks: Raynham Park and Wonderland Greyhound Park. It takes at least 1000 dogs to keep them going. But since 2002, when the state required the tracks to submit records of greyhound racing injuries, more than 800 greyhounds have been seriously hurt. And countless others have died. It's time to end this cruelty. And thanks to a coalition of committed dog lovers and concerned citizens, we can. Whatever your political beliefs, when you go to the polls on November 4th, vote "Yes" on Question 3.